I just had this heirloom tomato inspired epiphany. What happened was, I stopped at Morning Glory at the end of a quintessential September day. The sky was bright blue, the sun was warm, hot even, but a fresh breeze of blew gentle hints of fall across my skin. The farm stand was about to close. I picked up a bright yellow heirloom tomato, and it was cracked on the bottom. Just a little bit juicy, and slightly oozing. The next day it would be unsalable. To me it was perfect. So I saved it from the compost heap, where it was said to be headed, though I doubt the staff would have let that one pass them by. 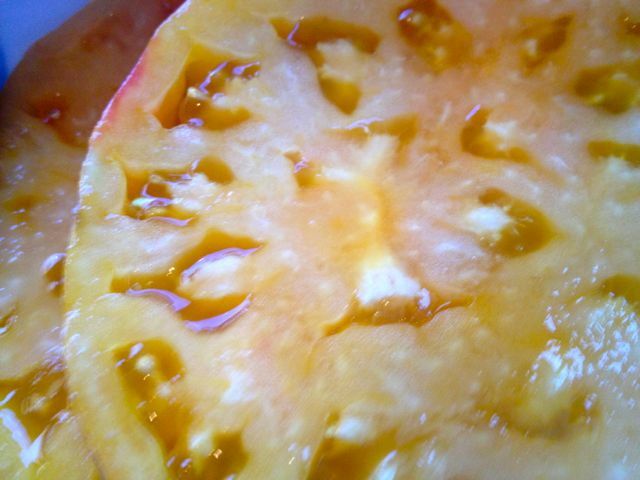 I took it tomato home (I’m assuming it is a Striped German heirloom) and cut a couple of slices. I tasted one bite and it blew my mind. I have seldom tasted an heirloom tomato so ripe. It is as if their skin splits, and that is the moment you should eat it. Not before. These varieties were not selected, afterall, for thick skins helpful in shipping. It was incredibly sweet, made irresistible with that tomato-ey tang. I did not need, and did not want, to do anything to alter that tomato. No salt. No oil. No dressing. Nothing. I realized something in that moment. I spend much of my life trying to live healthfully. Healthy living programs me, to some degree: where I shop; What I cook; What I order at a restaurant; How often I exercise. Really, how I structure my day. Biting into that tomato, I realized the burden of that effort. I realized, with produce this tasty, this fresh and therefore this rich in nutrients, that health, or at least a healthy diet, could be an effortless byproduct of just living. If I surrounded myself by fresh, local food, food grown by farms and farmers I trust, all the time, anything I eat would be contributing to, not threatening my health. I realized, wow, this is how things are supposed to be. Our food is not meant to be a threat to our life. Before processed, packaged foods and overly industrialized processes that made certain food products extremely cheap and abundant (sugar, corn syrup), but also unhealthy (CAFO meat), people ate food and probably did not question if they made a good or a bad food choice (unless they pondered if they consumed, say, a potentially lethal mushroom). They ate food that they grew, hunted, foraged. Food that was there for their taking, and necessary for their survival, and food that was, therefore good. I can be consumed, as a consumer, by how to make the right food choices. What freedom a life like that would be…can be; a life where all there is is good food.